Give away a dollar, and you’ll make someone’s day. Teach someone to give, and they’ll make a difference for a lifetime.The anonymous duo behind the @HiddenCash Twitter account didn’t quite realize that was the point when they started hiding envelopes of money and tweeting clues to their locations. With over 700,000 Twitter followers, they’ve become de facto leaders of an accidental movement to remind people there’s some good in the world and inspire them to pay it forward. The previously unnamed half of @HiddenCash agreed to reveal his identity to me, along with the story of how it all started, on a cool night in San Francisco’s Mission District. His name is Yan Budman, and he fittingly works a the Director of Marketing at Indiegogo, which lets people donate to creative projects. Budman’s eyes squinch up to make room for the giant smiles he’s prone to. It’s the contented grin of a thirty-something nice-guy who’s recently spent a lot of time watching people overwhelmed with glee thanks to his clandestine adventures. 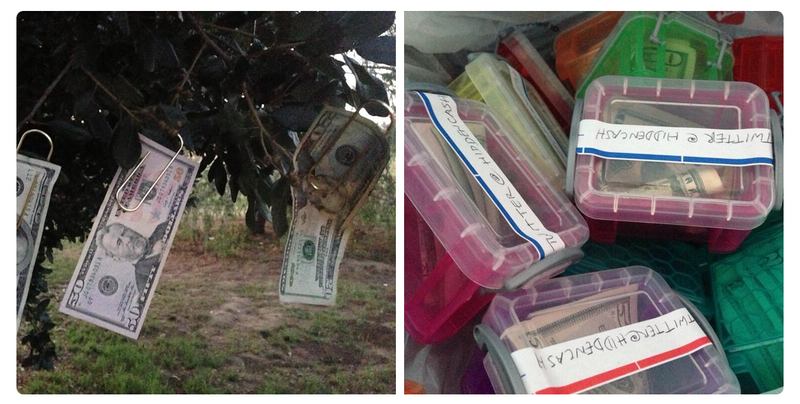 This Storify he made shows off a slew of HiddenCash missions and the people they touched. @HiddenCash began after his longtime pal Jason Buzi (previously outed via voice recognition from a phone interview in May) came into a little money from a business deal. Buzi had always been generous, having donated to charities, done volunteer work, and organized The Great Waterballoon Toss in Dolores Park. Driving through the Mission together around midnight, Buzi noticed a man who seemed down on his luck on the side of the road. He tried to hand some money to him, but scared him off. “There’s probably a better way to do this,” Budman said. “Like what? We’ll just hide money around?” Buzi replied. It turned out to be that simple. Buzi had never heard of Twitter but Budman had been onboard since 2008. He quickly snapped a photo of Buzi’s fist filled with money, and grabbed the handle @HiddenCash. The duo hid the first few wads of dough near some of their favorite businesses like Yoga To The People and Sightglass Coffee, where they hoped people would donate to instructors or buy some strangers a cup of joe. Suddenly, the whole thing took off. Within two weeks , the project had been featured on top news outlets like the BBC, and the Twitter account had boomed to a half million followers. At first glance, giving money to Twitter-equipped strangers doesn’t seem like the most effective way to do good in the world. @HiddenCash flies in the face of great data-driven philanthropy organizations like GiveWell, which helps donors deliver the most impact for their dollar by recommending charities with low overhead and a record of success. Anti-malaria mosquito nets, treating parasitic infections, and giving directly to extremely low-income individuals are all highly efficient means of reducing suffering. That’s why the retweet makes Twitter the perfect place for @HiddenCash. The concept can go viral. “The amazing thing about this technology is that it allows ideas like this to spread. If everyone around the world does these things, like gives away 10 percent of their income or volunteers 10 percent of their time, the impact is huge,” Budman says. Budman and Buzi have taken the show on the road. There’s now been around 100 drops totaling around $50,000 across over a dozen cities, including New York, Houston, Mexico City, and London. The pair have learned a thing or two, as well. They stick to hiding the envelopes in open areas so there’s less danger of someone getting hurt if there’s a stampede of scavenger hunters. It can take a lot to fulfill someone’s expectations. But if they don’t expect something good will happen, it doesn’t take much to lift their spirits: Pay for the toll of a driver behind you; give $20 to a street musician; buy a round of beers for strangers. “Anything that makes an impact with a small group of people and inspires them to do the same,” Budman proclaims. Turns out @HiddenCash isn’t about the scavenger hunt or even the money. It’s about reminding people that they, too, can conjure up the joy of serendipitous generosity.